AmphiTox-Pro (Amphi-NIL in some markets) contains all of the essential components for "Ultimate Toxin Prevention Program." 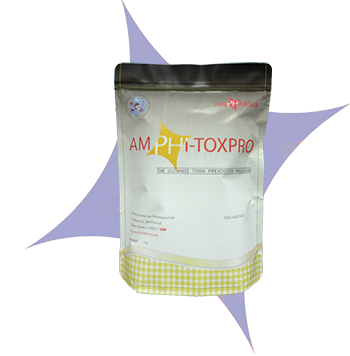 AmphiTox-Pro (Amphi-NIL in some markets) not only inhibits mold and binds toxins, it also enhances functions of the liver, neutralizes pesticide residues, flushes out salmonella, and improves performance & immunity. The unique balanced formula contains Hydrated Sodium Calcium Aluminosilicate, which is a very potent sorbent that reduces the toxicity of aflatoxins (AF) or T-2 toxin. HSCAS improves performance of the chicks and animals by reducing toxic effects and increasing body weight gain by 40% - 50% through increasing efficiency of feed utilization. AmphiTox-Pro (Amphi-NIL in some markets) contains a balanced formula of organic acids that works synergistically in improving the digestive process with its effect as an antibacterial and by reducing the pH of the entire digestive tract, thus promoting a better utilization of the feed and inhibits the growth of E. coli and Salmonella and other pathogens. Mannan-oligosaccharide, MOS is shown to improve gastrointestinal health, as well as overall health, thus improving well-being, energy levels, and performance of the birds and animals. MOS, through the binding to mannose, reduces the risk of pathogen colonization in the intestinal tract, and helps improve feed conversion, converting feed more efficiently into body tissue and increase body weight. AmphiTox-Pro (Amphi-NIL in some markets) contains activated charcoal, which is a very potent ingredient with its small particles and its highly porous surface works by binding toxins to prevent stomach and intestinal absorption. Activated charcoal also interrupts the enterohepatic and enteroenteric circulation of some drugs/toxins and their metabolites. AmphiTox-Pro (Amphi-NIL in some markets) contains two of the most important lipo tropic agents. Betaine, which is a powerful lipotropic agent that increases gastric acid and promotes the export of fat from the liver. Betaine is necessary for the maintenance of a healthy liver and essential for fat metabolism by burning the exported fat for additional energy. Inositol, is a potent lipotropic agent that plays a critical role in defending against toxic compounds as it assists in the detoxification reactions in the liver. AmphiTox-Pro (Amphi-NIL in some markets) contains oxine-copper, which is recognized as a very potent antifungal agent. AmphiTox-Pro (Amphi-NIL in some markets) helps prevent aflatoxicosis, prevents caking of feed, reduces PH of gut and feed, aiding in mold inhibition, helps prevent pathogen population, helps prevent multiple mycotoxicosis (T2, Citrinin, Zeorelenone, etc. ), aids in preventing Ochratoxicosis, helps prevent fungal contamination, assists in preventing stress on the liver, helps prevent immune stress, and helps alleviate ill-effects of pesticide residue. Prevents growth of mold & bacteria, exerts irreversible toxin binding, offers effective & irreversible toxin-binding due to ideal particle size, prevents ill-effects due to pesticide residues, protects liver functions & immune status, flushes out harmful pathogens, and improves performance & production. Hydrated Sodium Calcium Aluminosilicate (HSCAS) containing Alumina, Phosphorous pentoxide, Barium oxide, Potassium oxide, Calcium oxide, Silica oxide, Carbon, Sodium oxide, Ferric oxide, Strontium oxide, Hydrogen, Sulfur trioxide, Magnesium oxide, Titania, Manganese oxide, Chlorine, and Nitrogen. Buffered organic acids mix (containing), Citric Acid, Fumaric Acid, Formic Acid (Calcium Formate), Mannanoligosaccharide (MOS), Activated Charcoal, and Oxine Copper. Lipotropic agents mix (containing) Betaien, Inositol, other proprietary micro ingredients and patented mix.